I didn't know what it means, either. 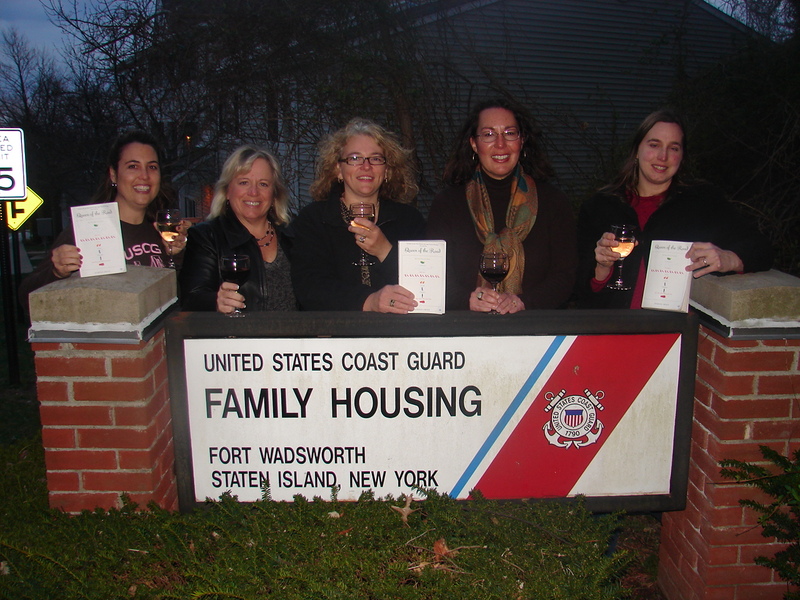 Our common denominator is that we are all spouses of Coast Guard active duty members stationed on Staten Island, New York or Bayonne, New Jersey. Every year a third of us move to a new duty station, so each year the composition of our membership changes dramatically. Because most of us are not near family, we rely heavily on each other for support and friendship. Our book discussions are usually liberally sprinkled with what is going on in our homes. She signed her email, "President, CG Spouses Club Book Club." Good thing, too: As Queen, I only deal with heads of state. The VP or (shudder), treasurer would never do. From left to right: DesaRae, Rhonda, Jada, Sonia and Brett. When we started the discussion, each of the women told me where they had lived and I do believe amongst them, covered most of the states. DesaRae has orders to leave for San Francisco in a month, and although seemed sad to leave her friends, was also hoping the move would help cancel out the Staten Island accent her twins had picked up. (Good idea - the younger the better. You should have heard my Long Island accent growing up. Oy. 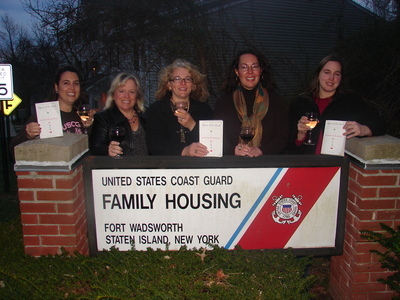 )In addition to being married to a Guardsman, DesaRae herself graduated from the Coast Guard Academy in 1994. Sonia was once stationed in Sitka, AK and I informed her that was our favorite Alaskan town. She proceeded to one-up me, saying it was her favorite place to live, ever. In fact, when she and her husband left on the Marine Highway's ferry, he grabbed her waist so she wouldn't be tempted to hurl herself overboard and swim back. I thought I'd post a couple of pictures of Sitka from our trip. Can you tell why we liked it so much? Hangin' at the RV park. Brett has also lived all over the place, and hails from one of my favorite parts of the country, Upstate New York. Rhonda's husband has been in the Coast Guard for 24 years and she also works for the USCG as a civilian employee. Jada grew up on a small Island off the coast of ME, and it seems hadn't traveled much until she met her Guardsman husband, who has been in two branches of service for a total of 20 years. Because they've been... well, everywhere, the gals particularly enjoyed the descrptions of places and sights in the book. I think they could also relate to being reluctant travelers at times, as I was at the start (well, OK - for a bit more than just the start) of our QUEEN OF THE ROAD trip. When I asked how they heard of the book, it seems some paperback book swapping website had deemed it "hot," so these terribly wise women unanimously agreed to make it their April pick. Hmmm. Pushing 50 as I am, it's been years since I thought of myself as "hot." Perhaps I'll have to rethink that, now. Poor Tim. If I do, he's likely to see a resurgeance of one of my favorite little pranks: Years ago, whenever we were in his Corvette at a stoplight, some guy in a car next to us would invariably smile and give Tim a thumbs up. I'd immediately primp, toss my hair and mouth, "thank you," to the unsuspecting man. Drove Tim nuts. So, for the pic of the two of you in chairs...did you have a reaaaallly long timer? Did you have a stand-in in your chair? Or had did you throw yourself over the log and drop into the chair just in the nick of time? It all looks so serene! You got it! LOOOONG timer. As I recall, there was a picnic bench I rested the camera on. Miles was laying down next to us, but unforutnately, you can't see him. I would dearly love to return to Sitka. This page contains a single entry from the blog posted on April 8, 2009 5:32 PM. The previous post in this blog was Temecula - Don't Worry, It's Not Catching. The next post in this blog is The Best State.